Roger Pielke Sr. has raised very strong allegations against RealClimate in a recent blog post. Since they come from a scientific colleague, we consider it worthwhile responding directly. Some aspects of climate change are progressing faster than was expected a few years ago – such as rising sea levels, the increase of heat stored in the ocean and the shrinking Arctic sea ice. Since 2007, reports comparing the IPCC projections of 1990 with observations show that some climate indicators are changing near the upper end of the range indicated by the projections or, as in the case of sea level rise (Figure 1), at even greater rates than indicated by IPCC projections. Pielke claims this is “NOT TRUE” (capitals and bold font are his), stating “sea level has actually flattened since 2006” and pointing to this graph. 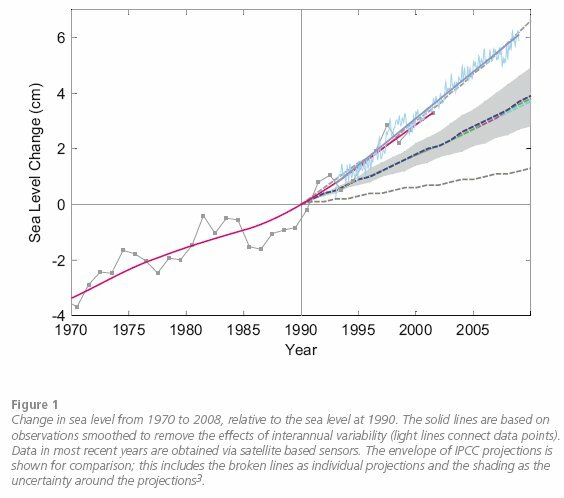 This graph shows a sea level trend over the full satellite period (starting 1993) of 3.2 +/- 0.4 mm/year and is very similar to an independent French analysis of those very same satellite data shown in the Synthesis Report (blue lines above). The best estimate of the IPCC models for the same time period is 1.9 mm/year (coloured dashed lines in the middle of the grey uncertainty range). Hence the conclusion of the Synthesis Report is entirely correct. The “flattening of sea level since 2006” that Pielke refers to is beside the point and deceptive for several reasons (note too that Anthony Watts has extended this even further to declare that sea level from 2006 to present is actually “flat”!). First of all, trends over such a short sub-interval of a few years vary greatly due to short-term natural variations, and one could get any result one likes by cherry-picking a suitable interval (as Pielke and Lomborg both have). The absurdity of this approach is see by picking an even more recent trend, say starting in June 2007, which gives 5.3+/-2.2 mm/yr! Secondly, this short-term trend (1.6 +/- 0.9 mm/yr) is not even robust across data sets – the French analysis shown above has a trend since the beginning of 2006 of 2.9 mm/year, very similar to the long-term trend. Third, the image Pielke links to shows the data without the inverted barometer correction – the brief marked peak in late 2005, which makes the visual trend (always a poor choice of statistical methodology) almost flat since then, disappears when this effect is accounted for. This means the 2005 peak was simply due to air pressure fluctuations and has nothing to do with climatic ocean volume changes. The trend from 2006 in the data with the inverse barometer adjustment is 2.1 +/- 0.8 mm/yr. 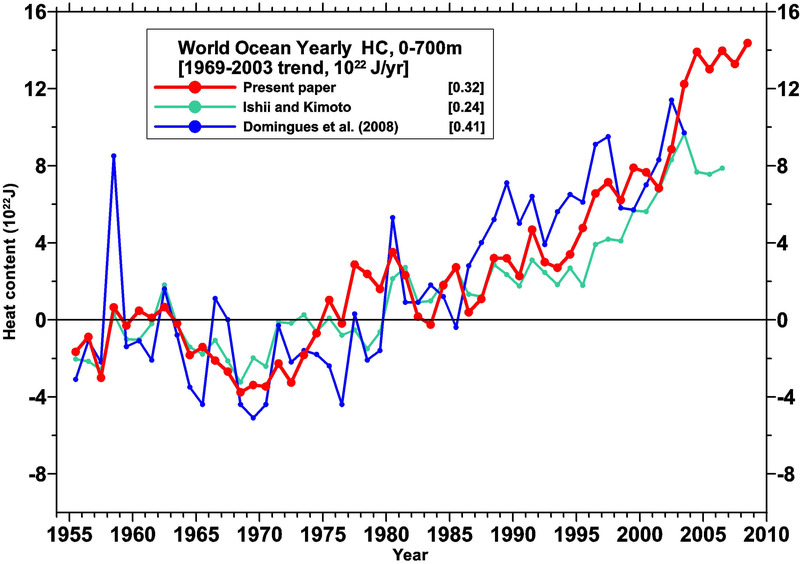 Current estimates indicate that ocean warming is about 50% greater than had been previously reported by the IPCC. For good reasons, the Synthesis Report discusses a time span that is sufficiently long to allow meaningful comparisons. But in any case, the trend in from 2003 to 2008 in the Levitus data (the Domingues et al data does not extend past 2003), is still positive but with an uncertainty (both in the trend calculation and systematically) that makes it impossible to state whether there has been a significant change. One of the most dramatic developments since the last IPCC Report is the rapid reduction in the area of Arctic sea ice in summer. In 2007, the minimum area covered decreased by about 2 million square kilometres as compared to previous years. In 2008, the decrease was almost as dramatic. 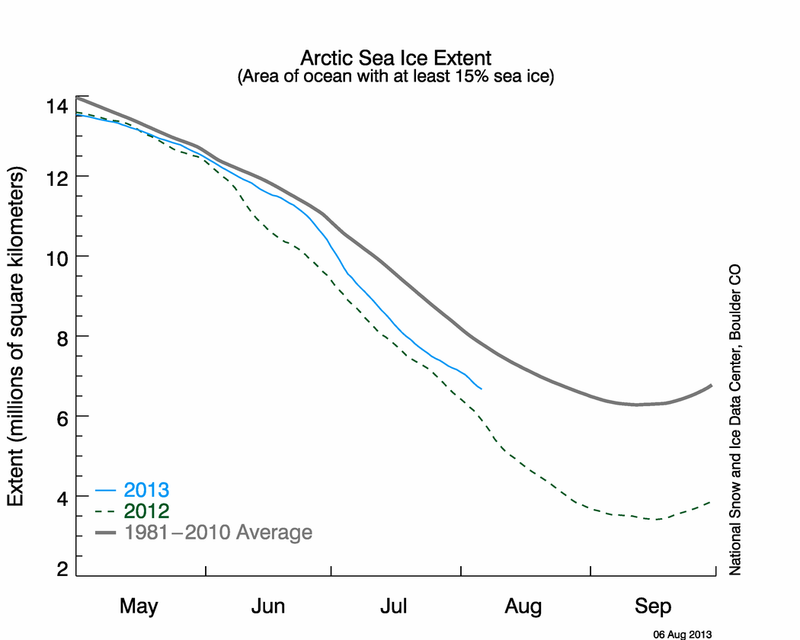 This decline is clearly faster than expected by models, as the following graph indicates. Yes, same thing again: Pielke’s argument is beside the point, since the Synthesis Report is explicitly talking about the summer sea ice minimum reached each September in the Arctic, and we don’t even know yet what its value will be for 2009. And Pielke is again referring to a time span (“since 2008”!) that is far too short to have much to do with climatic trends. Media and policymakers who blindly accept these claims are either naive or are deliberately slanting the science to promote their particular advocacy position. The phrase ‘rising sea levels progressing faster’ is clearly a statement that sea level rise is accelerating. Pielke is responding to the statement “Some aspects of climate change are progressing faster than was expected a few years ago.” and as near as I can tell is correct. The past “few years” show a definite leveling off and not an acceleration of earlier trends. He cannot be accused of cherry-picking since he is merely responding to the original statement which implies an acceleration of trends. Give the guy a break. Charlie asks what is the data. Ooh, bold font. Impressive desire. Charlie — did you READ the SOURCE for the statement? It’s identified. You’re acting like PSr. You can look this up. Just proclaiming that someone should _force_ the information on you because you’re standing there declaring you don’t know is, well, optimistic. The world doesn’t owe you an education, though the world may well try to make you smarter, like it or not, in some situations. “Give the guy a break. Maybe if he’d acted worthy of it. But in this case, he doesn’t and has in the past acted in the way you complain about here. Why treat someone better than they are willing to treat you and have given every indication that this will never change? You might note that those denying the science on global warming tend to be preaching economic catastrophe if we dare seek to reduce emissions. Since such claims aren’t remotely backed by objective economic studies (as opposed to global warming concerns being backed by a preponderance of evidence), one could call it alarmism. Recent compared to what? Compared to the estimation that has been exceeded in scope. Not recent as in “the last couple of years” unless the estimation was done a couple of years ago. And why did you go to all that trouble making the quote bold? Only if the assessment of the prediction and the measurement of the outcome are done on a shorter timescale. This is not what the report is doing. It IS what Pielke (and you) are doing. This issue seems to be pretty simply resolved, so can I go on a slight tangent? The climate models produce their own wiggles and noise, which we’ll call internal variability. Among this is something similar to El Nino/La Nina. If I understand, the models cannot predict the phase or timing of ENSO events. Do you think it will ever be possible for the models to do so? Or is the phase of ENSO inherently a chaotic “weather” initial value problem, and we cannot realistically hope that GCMs will ever get to that point? So we can see that, it was RC, not RP that started to analyze climate change metrics based on “a few years”. But English is not my native language, so maybe there is a word or two that need explaining. An inline comment has been added to my comment #35. The situation is much clearer to me now. It is simply a matter of my misunderstanding the context of the statement. Some aspects of our UNDERSTANDING AND MODELING of climate change have progressed rapidly over the last few years and these changes in understanding and modeling have caused us to increase the projected changes. I would counter by asking, Why say something is “progressing faster than was expected a few years ago” when you mean it was progressing faster than you believed a few years ago? The use of present continuous clearly implies that the difference is not in the projection made a few years ago, but rather in the evidence collected today. if you show the sea level rise, please show the 100a cycle and we all will see, that the rise in the 1st half was faster than in the second and there is now acceleration found in the last years. but this is what you want to tell us. have a objetiv look at the last 10 years, you can not pronounce, that warming goes on like predicted, not as sea level rising and so on. if you and your modells would not fix this strong on co2, you ll maybe do better predictions in the future. your way ist a too simple one way. I check out Pielke Sr’s blog occasionally and have seen _this_ trend: he refers to his own publications and those that support the same conclusion and then asserts that those conclusions are fact and anybody disagreeing (i.e. publishing with different results) is not just of another opinion, but is wrong – and here is the proof. It’s another form of cherry-picking, and his “not true” assertions are just a form of that. Since the short-term-in-place-of-valid-trend habit has become one of the main techniques for many, he has joined the crowd. While I have suggested that spending time countering denialist rhetoric is not the best use of RC’s time, Pielke, whatever we are to make of his blogging methods, is not a denialist – he accepts AGW in general. I think it is good for RC to respond to actively-publishing scientists that RC feels are getting it wrong (and of course especially when they target RC – as many are now doing). As can be seen, Pielke’s views and those of this supporters are presented here, although they certainly aren’t formally peer-reviewed. Real Climate could be an important venue to permit the presentation and debate on the diversity of peer reviewed perspectives on climate. However, they need to permit all such viewpoints to be presented, as well as not attack (or permit their commenters to) colleagues with whom they disagree. I find the juxtaposition … hilarious. We ridicule people who look for meaning in three year spans, as above. Yet in some important papers, the few years after Pinatubo was used as a test of the models and the water vapour feedback. Is this possible because the forcing due to Pinatubo was so strong that its effects dominate over the internal noise and fluctuations? I see there was an El Nino in 1991; can we say that a sufficiently strong external forcing can overwhelm an El Nino? Is there maybe a rule of thumb for how strong a forcing has to be, for its effects to be clearly seen on a short time scale? Or is this a poorly posed question? So anyway, Pielke has posted on his website what he intended to dispute. Perhaps that will help focus the argument. In the meantime I have, over the last few days, looked at more graphs of sea level rise then I had ever expected to. It appears to be very episodic. Is there any reason to believe that a ten year span of sea levels is sufficient time to detect a statistically significant change in trends or could a ten year period be just noise? Holgate still has a higher sea level rise trend for the years 1904-1953 then he does for the years 1954-2003. This is from Proudman Oceanographic Laboratory but since Science is still charging for more then the abstract and since I am cheap I will leave it to those with access to let me know if it has been misrepresented. I suppose I have no more reason to trust this website then I would one called woodfortrees for instance. I’m sure they are good or Gavin wouldn’t use them but I can see how a skeptic might wonder at being refered there. “Charlie — did you READ the SOURCE for the statement? I don’t think most politicians and members of the public will read all of the supporting material or the report that is being described. They will read the description and assume that it means what it says. It is clear now that the statement wasn’t intended to say climate metrics are progressing faster than expected, but that climate models and analysis is progressing faster. From 1953-2006, the observed September trend is -7.8 + 0.6 %/decade, compared to the multi-model mean trend of -2.5 + 0.2%/decade. For 1979-2006, the numbers are -9.1 +1.5 % (observed) and -4.3 + 0.3% (modeled). Even larger differences are found for the last 10 years. At present, summer minima levels are approximately 30 years ahead of the mean model forecast. Interesting, isn’t it, that Pielke is attacking a blog but not the published work that said blog comments appear to be based on? Just goes to show that illegitimate scientific claims can’t stand the light of peer review. An honest and unbiased researcher who ran a blog on climate would attach a disclaimer to that page stating that the paper had been withdrawn – or am I missing something here? By the way, collegiality is the root of cronyism and nepotism in the scientific establishment – something all scientists should keep in mind. Good colleagues may keep their mouths shut as you blunder away – but a good adversary will point out your mistakes as you make them, which may be painful but which will also keep you from making truly epic blunders. So, good scientists make a point of ignoring their colleagues and cultivating their adversaries. In that way, you make faster and more reliable progress. The opposite approach is to surround yourself with so-called ‘yes men’, aka ‘sycophants’. In other words, scientific progress is all about ‘indiscriminate bashing’ – and that means that emotional attachments to scientific theories are counterproductive. This is the problem with the denialist camp – they just can’t admit they’ve made such massive errors. Perhaps the scientists here can tell me, what exactly is a “peer reviewed perspective“? Where does one submit one’s “perspective” for peer review? I would counter by asking, Why say something is “progressing faster than was expected a few years ago” when you mean it was progressing faster than you believed a few years ago? I’m struggling to comprehend the implied difference here between “was expected” and “you believed.” The subject in both is functionally the same. The expectation is a belief, based on facts researched by climate scientists. I must say I find this kind of reading silly to the point of being willfully obtuse. The line of defense that Pielke has established is to suggest that this sentence suggests something that only someone unfamiliar with scientific methods could confuse. That is the strongest suggestion yet that Pielke is knowingly being deceptive. The expectation of climate change is what has changed, not a small subset of data points that couldn’t be used to prove anything one way or the other. The only way you could misread this statement is if you think reports about climate change are not based upon actual projections but rather cherry picked data (which is precisely what Pielke has done in order to refute it). That kind of straw man fallacy makes serious rebuttal almost pointless. If I were to criticize real climate, I would agree that some opportunity is being lost. I personally think that some of the wording is too technical for a general audience. If someone does not have a scientific education, he or she may be confused by so many technical terms being used. As the saying goes, keep it simple stupid. I would also criticize the writing style of just about every climate site on the Internet. Good scientific information is usually presented humbly by the author. A little bit of humble pie would go a very long way in the climate science community. Quite frankly, many scientists have been way out of line with their writing, and it puts a bad face on the scientific community. Instead of labeling ideas as stupid or people as deniers, educational writing illustrating the errors and the solutions to correct them should be preferred. The political charge of climate science does not excuse the current trend of writing by professionals. Science education is not a political campaign, and it shouldn’t read like one. I read this as Pielke referring to current measurements not being as dramatic as 2007. Therefore, Pielke is flat out an amateur about sea ice, a bad amateur, given the power of the internet to study so many critical features on a daily basis, not only ice conditions, but the weather giving these conditions. 2007 had a perfect climate mix, world wide signals affecting the Polar regions, the El-Nino during winter of 06-07, followed abruptly by La-Nina in spring and summer had significant secondary effects, giving a mild cloudy winter and a very sunny hot summer over the Arctic Ocean. expanded melting, and summarizing a return to ice normalcy imminent, is not a scientific statement, but one born from willful ignorance, wishful thinking driven by the cause of ridiculing sound science by any means possible, providing raw meat for the contrarian megaphone propagandists. Pielke delivers here, his true colors, facts are useable without context, this way any fact, may seem irrelevant. I agree with Ike, there is a high degree of collegiality within the climate scientific establishment. Charlie also has yet another interpretation of the text, made without reading even the executive summary, let alone any of the abstracts, from which it’s quoted. Charlie, quotations have to be read _in_context_. You write “it is clear now”– then give two wrong interpretations, and pick your own new one. So what does it say? Our regular readers will hardly be surprised by the key findings from physical climate science, most of which we have already discussed here. Some aspects of climate change are progressing faster than was expected a few years ago – such as rising sea levels, the increase of heat stored in the ocean and the shrinking Arctic sea ice. “The updated estimates of the future global mean sea level rise are about double the IPCC projections from 2007″, says the new report. And it points out that any warming caused will be virtually irreversible for at least a thousand years – because of the long residence time of CO2 in the atmosphere. Since the very next sentence addressed “IPCC projections”, it clear from the context, that changes in climate change projections were being discussed. The alternative interpretation, doesn’t make much sense. It’s puzzling that Roger Pielke Sr. would take RC to task, in this instance. Perhaps the allegations are being made against RealClimate for only summarizing key findings of the Synthesis Report of the Copenhagen Climate Congress because he, as a skeptic, is apprehensive of RC’s influence in documenting climate change. My post #76 apparently collided with a spam filter. Gavin’s point about the important distinction between improved analysis versus new data is something easily lost, well worth emphasizing. I apologize, a noisy comment, off the topic. Al Gore says in his movie “this is a moral issue”. When *important* things like money and pride come into play, a lie easily becomes a legal issue. Can you lie to your government about your income? There are so many knowledgeable people bowing down to mother earth! Why don’t they introduce the legal whip for those barkers? If you include the extent of 2008 Arctic sea ice in a climatic 30-year time series and compare it to the trend from the previous 30-year series ending in 2007, you will get a slightly gentler slope, no? I agree that this whole discussion is ridiculous and we should get on with something constructive, and return to this debate in 2015. This year’s melt has so far been tracking very close to the big melt of ’07. Once we get a full three year’s data since ’06, will that data be enough to show that the melting trend–fairly linear from ’80 to ’06–has now entered a new, less-linear phase? The most recent methane data also seem to continue the upturn in methane concentrations that started in ’07 (as I recall). How will long will it be till we can call this a new trend? suggestive, at least, that the well attested melting tundra (and perhaps the less-thoroughly attested release of seabed methane hydrates) are now large enough that they are showing up in the data of atmospheric concentration, i.e. that we have entered a new trend of methane feedback? Instead of labeling ideas as stupid or people as deniers, educational writing illustrating the errors and the solutions to correct them should be preferred. The political charge of climate science does not excuse the current trend of writing by professionals. Science education is not a political campaign, and it shouldn’t read like one. So essentially you want the debate about climate change to return to what it was before oil companies paid out so much cash to poison the well? The criticism of Dr Pielke’s points 1 and 3 are reasonable. Point 2, not so much! should not have been used! sleight-of-hand arguments supporting the cause. As mentioned the previous several times you posted this on other blogs, most relevant is the end-of-season minimum sea ice extent. Note the trend and the acceleration of loss. 2009 is trending a bit above the record at the moment, but well below average. Of course, since sea ice changes don’t contribute much to sea level, I find new discoveries of Antarctica ice sheets losing ice on balance to be more interesting than sea ice trends. You can already call the upturn in CH4 concentration a trend; although the time period is short, the signal-to-noise level is high enough that it’s undeniably significant. Gavin’s statement is correct, however, that the net increase has not so far been large enough to have a notable climate impact. If, however, the trend continues, that will no longer be the case. What I’ve looked at so far (only a limited amount of data) indicates that arctic rises are larger than south polar rises; I don’t know about northernmost stations vs the rest of the globe, and I don’t have any data (yet) about 13CH4. The NSIDC released the June figures to-day and I posted them, as I do at the end of each month. I have attached no importance, to their significance, at all. tamino, We must wait for September, in order to get 2009 report. I promise to post, then, too. It’s not exactly cherry picking, as it is the latest monthly data. how much heat is this ? Uh, Dude, have you ever been to a scientific conference. Scientists are not known for low ego mass. Formal written publications are one thing, but talks, blogs, discussions around the coffee pot… can all get pretty rough. Look, the first time a wildly wrong idea is posited, patient explanation is warranted, but after it’s raised seventy times seven times by the same person, even Jesus might be tempted to question their sinceriand intelligence. Climate scientists didn’t make this issue political. They raised a concern to policy makers and were met with Congressional subpoenas. After 30 years, at some point, you just have to admit that some people are uneducable. Let’s hurry up and get something better on television so they’ll quit standing in the way and the adults can get something accomplished. Bob Lear (25) — We are currently experiencing the longest solar minimum since 1913 CE. Despite this, 2008 CE was about the tenth warmest year on record. You may care to compare this to the rank of 1913 CE. David, consistancy of argument seems important to me. If co2 forcing would require a long period of time to warm the earth due to oceans delaying response then solar forcing would also require a long time to warm or cool the earth. I’m not supporting solar forcing as a primary climate driver since a mechanism hasn’t been identified, just pointing out the argument should be the same. This is off-topic. I just don’t know where to ask this question. Some people were by our county looking at caves for sequestering CO2. Instead of storing it in caves, which seems like a bit of a waste. Why don’t they release it in the rainforests, or orchards? Trees and plants are nature’s recyclers, they could use that CO2 and produce more O. Instead of redistibuting income, you are redistributing CO2 from the places that don’t need it to the places that do. You get stronger, healthier plants, less CO2 and more O. Why are we storing CO2 in caves. However, RC posted the criticism of Pielke at 9.09pm on July 01, and Pielke’s response appeared at 9.11am the following morning. Time Zones notwithstanding, if responding rapidly is now some kind of flaw in the Wattosphere, then he really should be pursuading his good friend Roger to get more sleep…. Steve, the mechanism we can measure is the amount of energy in sunlight. If there’s a mystery mechanism besides, it has to somehow subtract the amount of forcing we know exists, and then replace it by something else that’s undetected. The idea that solar and CO2 should have equal delays doesn’t make sense. Look at the answers to “what would happen if the sun went out” for details. Most sunlight reaches the ground promptly because the atmosphere is mostly transparent in the visible range. Most outgoing energy is in the infrared band and is delayed by greenhouse gas interactions with the atmosphere, and spread around during the delay. steve (94) — The slight additional warming and cooling over a sunspot cycle does not penitrate very far into the ocean. The lag, similar to the lag experienced over the annual cycle, is about 1 year. This indicates the lack of depth. This is, of course, a rather short term forcing, the average solar sunspot cycle being 10.448 years according to some NOAA site. The sun is very slowly warming up, but this has no effect during the instrumental record or even, I think, the ice core records. We are not discussing locker room talk, but publicly created information outlets to education the general public. Children come to these web sites, and they see scientists conducting themselves poorly instead of enlightened well educated people. While dealing with so many uncertainties around climate science, many people may find themselves proven wrong. Some people from both sides may eventually regret making some of their comments. An ego is not a good quality for a person to have, and it is a trait of the uneducated or rude. After an explanation is made, you can refer future questions with a link. Dealing with the public has never been easy. What argument? Bupkes! Physics is still extant, CO2 rises, new equilibriums are sought.